The electric field vectors due to the –2.0 nC source charge are shown at right, where they all point in towards the negative source charge. 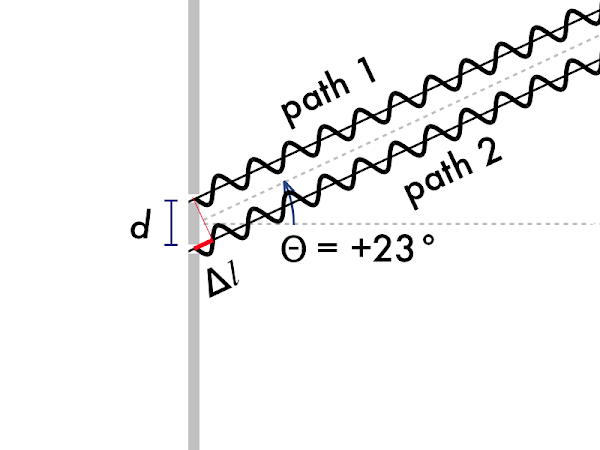 (The magnitudes of these electric field vectors are not quite to scale, but do get smaller with increasing distance from the –2.0 nC source charge). The electric field vectors due to the +8.0 nC source charge are shown at right, where they all point out away from the positive source charge. (The magnitudes of these electric field vectors are not quite to scale, but do get smaller with increasing distance from the +8.0 nC source charge, and are proportionally larger than the electric field vectors of the less –2.0 nC source charge). The total electric field at x = +0.5 cm due to both source charges would be the vector addition of the individual electric field vectors at that location, as they point in the same direction (to the left). The following questions were asked on reading textbook chapters and previewing presentations on charges and materials and electric forces and fields. "Negative and positive charges are attracted to each other. Also, net neutral objects can attracted to charged objects." "In insulators electrons are fixed while in conductors electrons are free to move around the material. Polar molecules are more positive/negative at different parts of the molecule due to the electrons being at different parts of the atom more." "I understand that if a negative source charge interacts with an insulator, the electrons will be repelled to the other side of the insulator, such that there will be a net attractive force on the insulator." "Opposite charges are attracted to each other. Coulomb's law is used to find the magnitude of force that a source charge exerts on a test charge." "I understand the electric field and how charges exert electric forces on other charges. Coulomb's law quantifies the magnitude of the force that a source charge exerts on a test charge, separated by a distance r."
"I understand a little about Coulomb's law. The value of q1 represents the source charge and the value of q2 represents the test charge. In addition k is a constant, r is the distance they are apart and if the q values are opposite in signs the charges are attracted and if the q values are the same in signs they are repulsed." "Thankfully this is chemistry review so not much review is needed other than the application of it in physics." "I am having a hard time wrapping my head around electric forces and fields. I'm sure some examples in class would help me make a connection." "I'd like some in class clarification on electric forces and fields. I'm lost." "Why is the electric force along the electric field direction on a positive test charge, and the against the electric field direction for a negative charge?" "I definitely need some help with this material. It was difficult to decipher." "I'm having some issues with the electric field models. In the online lectures I'm not really sure as to why the two field models are mathematically different. I mean I understand them from problem solving perspective but I don't really get it from a conceptual perspective." "The fields were a little confusing overall, but I think with some in class problems (which I'm sure we are going to do) it will make more sense." A gas pump fire is inadvertently caused by the sudden discharge of an electrical spark. Describe when and how the woman became electrically charged. "The woman transferred electrons between her hands and her shirt when she adjusted it." "When she sat down in her car she may have become positively or negatively charged (doesn't matter which). She may have some sort of cloth car interior." "The woman has some sort of felt seats. When she got in and out of the car, without electrically grounding herself by touching the metal car, she became electrically charged." "Static built from her shirt or the wind was stored in her body and released when she touched the gas pump." 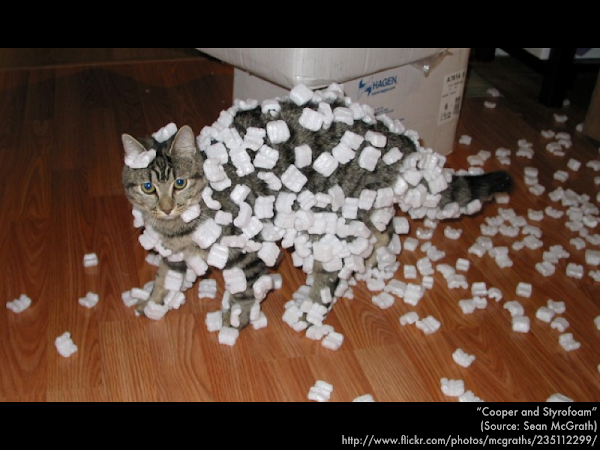 Electrically neutral polystyrene "packing peanuts" would be attracted to a cat that has __________ charge. An electrically neutral aluminum soda can would be attracted to a balloon that has __________ charge. Electrically neutral polar molecules in a water stream would be attracted to a comb that has __________ charge. Explain the difference between units for electric force, F, and the electric field, E.
"E has the units of N/C while electric force F has the units of N."
"Electric force F is in units of newtons (N). Electric field E is in units of newtons/coulomb (N/C)." Explain the conceptual difference between the electric force, F, and the electric field, E.
""I think the electric force is just based on if the charges associated with the atoms are repulsive or attractive. The electric field is created by a source and that field then exerts a force on another charged particle." "The electric force happens inside the electric field because the field exerts some force on an object." "Electric fields are capable of exerting a force, but not vice versa." Explain the conceptual difference between a source charge (±Q), and a test charge (±q). "The source charge exerts a force on the test charge. The source charge is responsible for creating an electric field. The presence of a test charge causes an electric force to be exerted." "Q is the charge that is creating the field, and q is how we can test what direction the field is." "A source charge is the what creates an electric field, and a test charge is what receives the force from the field." "The source charge creates an electric field anywhere around it. This electric field exerts a force on the test charge." "Source charge creates E field. The test charge obeys or disobeys the E field." "The change of subjects is kinda scary now... I am still trying to understand double-slit interference..."
"Please go over the positive/negative source charges and test charges. Thanks!" "Hey P-dog, can we go over electric fields? I'm not entirely sure what is going on." 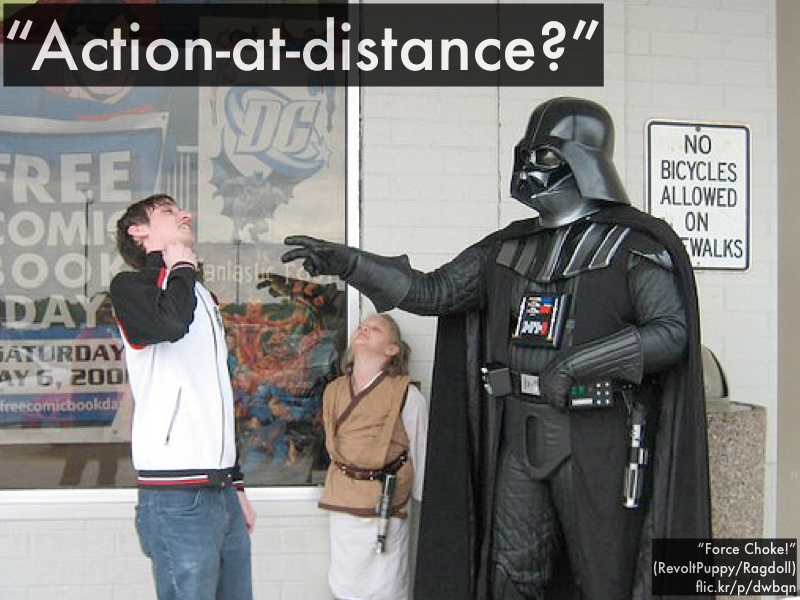 "This presentation made my brain hurt..."
The force on the –4.0 µC charge at x = +1.5 m points to the right, such that it is being repelled by the unknown charge at the origin. This means that the charge at the origin must also be a negative charge, as like charges repel. As discussed above, this charge is expected to be negative, such that to two significant figures the charge at the origin is –1.3×10–8 C.
or to two significant figures, 0.19 m.
"The textbook talks about how neon signs work and I thought it was really cool." "I knew that neon lights had to do with heating gases but I had no idea that the light's color was directly a result of the energy generated by the electricity." "I didn't realize that neon is only one color of sign and that different colors are made by different gases." "That electrons can absorb and emit different photon colors and the mixture of different gases can make colored light. I found it interesting because I never knew what caused the different colors in lights and neon signs." "How when atoms get excited they produce light, this is interesting to me because without this phenoma, the world would be dark." "The convection process of the sun was interesting. I thought the sun just spat out heat and there were no cool spots that were recirculated. Also I had miso soup last night so, that caught my attention." "How the sun works like a lava lamp and has magnetic fields/poles." "The three different outer parts of the sun were pretty radical. Never heard about the corona--it's hella hot." "That the corona is hotter than the layers underneath it. I'm also quite confused by the explanation for that, but I still found it interesting." "Honestly, none of it was interesting in this chapter." "I found the excitation of atoms uninteresting and confusing because there is a long explanation for it that doesn't make too much sense." "I am confused by the electron rule and the photon rule. I need some more clarification on the two ideas. I think an explanation in person will help me understand the concepts better." "I struggled a lot with the 'chemistry' part of this section." "Atoms because I'm dumb at science and could never figure out atoms." "I think quantum leaps will be difficult." "I'd like to know more about why sunspots appear black. It wasn't quite clear to me." "How are sunspots cool when the sun is supposed to be extremely hot?" "I found the electron rule and the photon rule to be a little confusing." "These sections were intense, and I feel overwhelmed by what we need to know from them." "I'll never look at gravy or miso soup the same again." "How much wood could a woodchuck chuck during a lunar eclipse seen from San Luis Obispo? (That depends--is it day or night in San Luis Obispo during the lunar eclipse.)" The following questions were asked on reading textbook chapters and previewing presentations on double-slit interference. "The general introduction to double-slit interference; more specifically the modified 'Train of Pain.'" "We are able to find out if constructive or destructive interference occurs at a detector when two in-phase light waves are situated so that they are offset at an angle, which therefore also produces a difference in length. We can use an equation to find maxima/minima, angle, and length as they are related to each other." "When comparing two waves that are both in phase, we're trying to figure out how much longer it takes for one wave to travel than the other. The path difference, how many wavelengths, etc." "When considering path differences we can make the assumption that the detector is sufficiently far from the source of waves and that the two waves (d apart) travel along a parallel path. This makes it so that the location of the detector can be specified by a specific angle." "Double-slit interference is basically a case in which waves from two side-by-side in phase sources interfere in both a constructive or destructive manner. In this lecture, source phases do not matter since we are looking at only in-phase sources, so our main focus of attention is looking at the path differences. The minima are where the paths interfere destructively, and the maxima are where the paths interfere constructively. There exists a trigonometric equation to determine how long a path is relative to another path as well." "When we change the path of two waves, it affects the distance the waves have to travel to reach a destination. The equation delta ∆L = d·sinθ will tell if the interference is constructive (maxima) or deconstructive (minima)." "The maxima and minima angles can give us constructive or destructive interference. This interference could be the product of waves having a path difference of a whole or half wavelength." "Nothing was really confusing so far. I think the only thing harder to understand for me was the diagrams and the angle itself how that is found." "How the altered distance of the two parallel waves effects their in/out of phase properties." "I need more help on applying the ∆L = d·sinθ equation." "I seemed to have understood this alright. Some lecture time would help me though." "I'm confused about when a path difference would be destructive. My assumption is that the waves are constructive when the angle is at 0 degrees and destructive when the angle is larger or smaller than zero because these cases require that one path be shorter than the other." "The path difference is really confusing to me. I think because it is harder to 'picture' in my head as I think it out." "I don't understand the principle of a diffraction grating." "Could you go over the equations?" "I really don't find this presentation confusing. But how do we know and test which angles will be destructive and constructive?" "I was pretty lost on finding the maxima and minima. I understood how you can manipulate delta l to be able to plug in wavelengths and m and then solve for an angle theta, but I don't know how this angle really comes into play in the big picture of it all." "I really don't understand how path length differences are calculated." "I didn't find anything too confusing in this lesson." 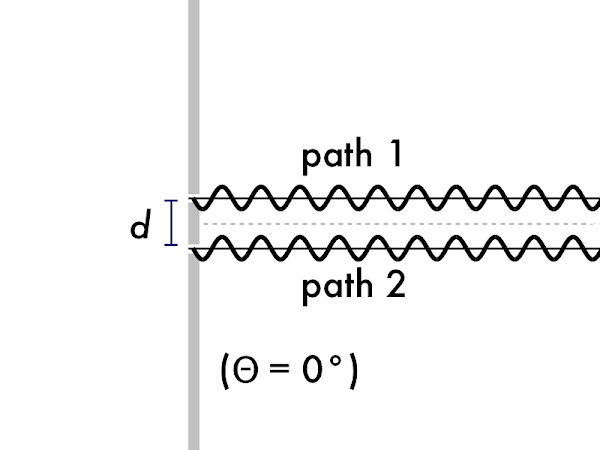 Explain the difference between "maxima" and "minima" in double-slit interference. "'Maxima' is constructive interference and 'minima' is destructive interference." "When two in-phase sources in a double-slit interfere at maxima this is constructive interference, and when they interfere at a minima there is destructive interference." "Review the above three diagrams from this assignment?" "I could never go wrong with some more practice with the types of problems above, hopefully we have some in class :) ?" "What is y? I put 'position along the screen as measured from the centerline.' Not sure I see what we are talking about." "I am sorry I could not think of anything funny to write or ask this time, I will do better next time I promise. A red laser (wavelength 632 nm) illuminates two slits, producing a first maximum located at angle of 27° on a screen located 1.75 m away. The two slits are spaced __________ apart. or to two significant figures, 1.4 µm. Since the wavelength λ and the slit width W remain constant, the "spread angle" θ is unchanged if the distance from the slit to the screen in increased. 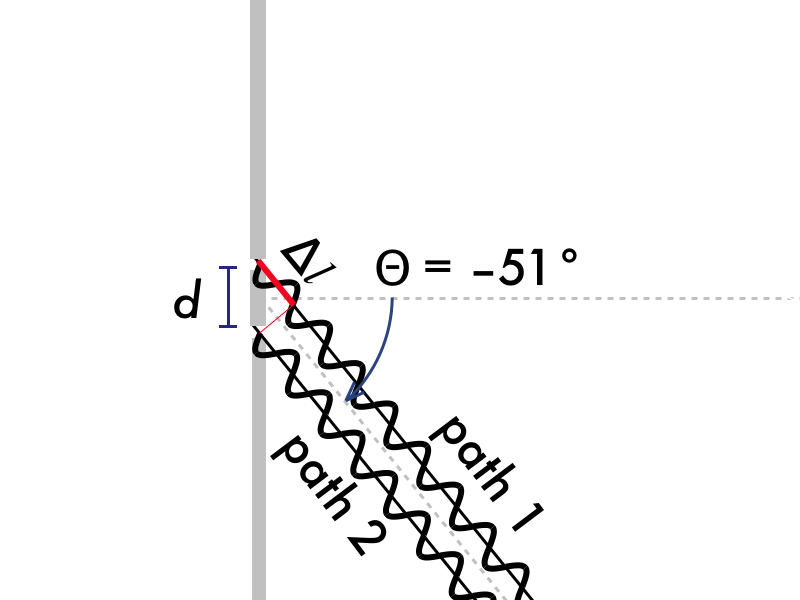 and since the distance L from the slit to the screen is increased, while the "spread angle" θ remains constant (as λ and W are constant), then y, which is one-half of the width of the central maximum on the screen must increase, and correspondingly the width of the entire central maximum on the screen would increase as well. Light from a green laser pointer (wavelength 532 nm) illuminates a single slit. If the slit is made narrower than __________, the first diffraction minima will not be visible anywhere on a screen. Since both responses (C) and (D) have slit openings greater than 532 nm, they will produce a first minimum fringe at θ = 41.9° and 30°, respectively. Response (B) has a slit opening that is equal to the 532 nm wavelength, such that θ = 90°, which is the boundary case where an opening slightly larger than 532 nm that would result in a spread angle slightly less than 90° (and thus be visible on a screen), and an opening slightly smaller than 532 nm would result in an undefined spread angle, as the inverse sine function would operate on a value greater than 1, so there would be no first minimum fringe at any angle (or on a screen) if the slit opening W is less than 532 nm. Response (A) is already too narrow to produce a first diffraction minima, as it is already smaller than 532 nm. Astronomy current events question: Mars' dust storms causing escaping atmosphere? Mars' __________ has been proposed as how water vapor is carried up into the outer atmosphere to escape. (A) moons, Phobos and Deimos. The __________ of giant star π1 Gruis was imaged using interferometry, where light was simultaneously combined from several different telescopes. hi = –(+1.0 cm)·(–6.0 cm)/(+10 cm) = +0.60 cm. where f1 is the focal length of the student's (accommodated) cornea/lens, and di is the distance from the student's cornea/lens to the retina at the back of the eye, where the (inverted) real image is projected. where f1 is the focal length of the student's (accommodated) cornea/lens, f2 is the focal length of the contact lens, and di is the distance from the student's cornea/lens to the retina at the back of the eye, where the (inverted) real image is projected. where the units of diopters (D) is equal to inverse meters (m–1). 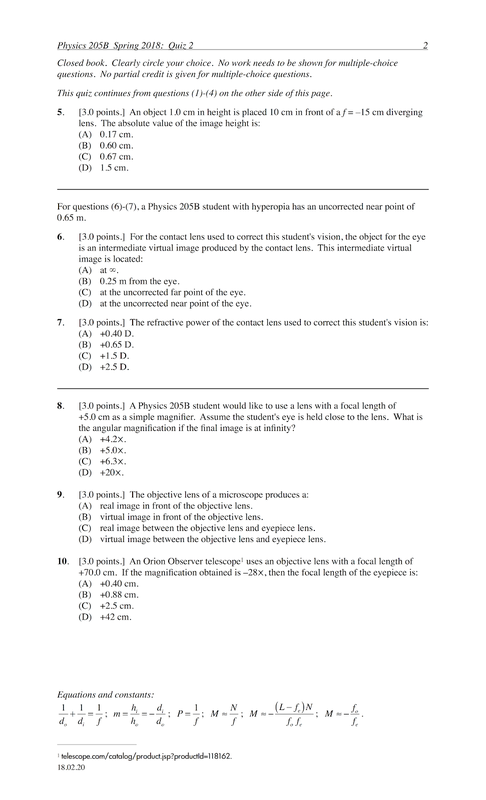 A Physics 205B student would like to use a lens with a focal length of +5.0 cm as a simple magnifier. Assume the student's eye is held close to the lens. What is the angular magnification if the final image is at infinity? M = N/f = (0.25 m)/(+5.0 cm) = +5.0⨉. feyepiece = –(+70.0 cm)/(–28) = +2.5 cm. 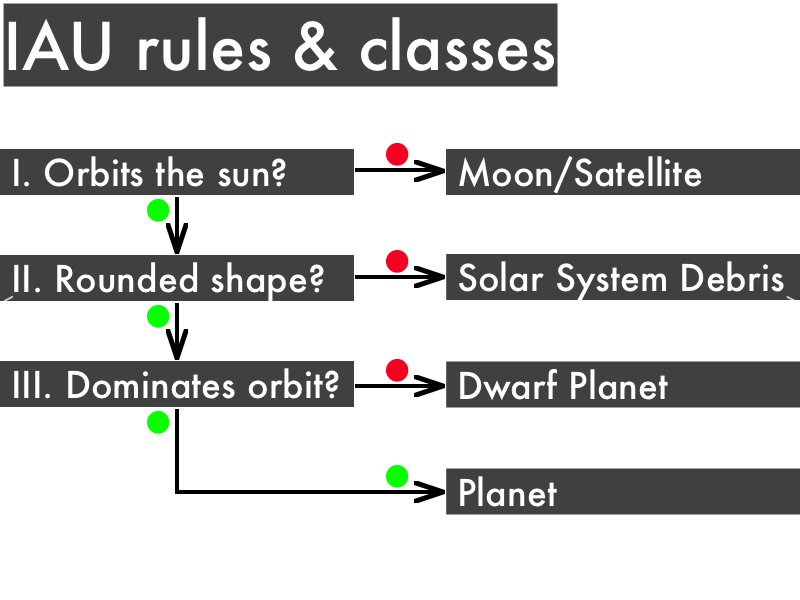 "The reasons why Pluto was downgraded from being a planet to a dwarf planet." "Venus in particular--being covered by a fresh crust over and over is pretty fascinating, and the question of whether or not its core still has what it takes to erupt again seems especially interesting to think about." "I enjoyed the gopher analogy relating to volcanic activity on Venus, it was interesting to imagine. I also really liked the example of convection currents demonstrated by the coffee and cream example, that was really cool." "The runaway planets: Venus and Mars. Also how bad the environment of our planet is, and how my history professor has the guts to stand in front of the class to say that he does not believe in global warming." "I thought it was interesting to see what characteristics a planet needs to qualify as a planet. It's something that I rarely think about and getting an explanation for it was interesting to learn about." "I found it very interesting that despite being about half of the size of Earth, Mars has relatively the same amount of land cover as Earth." "Mars as a 'runaway refrigerator'--it really illustrates just how much a planet can be changed due to an imbalance of its carbon cycling. It is also interesting to me because it really brings me back to the lecture last week about the fact that Earth's oceans may nearly be at full capacity when it comes to soaking up carbon dioxide from our atmosphere. It makes me wonder what the changes brought onto Earth would really be if we were to never find a solution to this issue. So I suppose we can say that this is a topic that is both interesting and depressing to me." "I had no idea that Mars possibly could have enough water to fill oceans! And that it still has water (permafrost.)" "That the planets with the most mass are the ones that produce and retain the most atmosphere. It makes perfect sense, but I had never really thought of it before." "I have enjoyed learning more about greenhouse gases and the effects they have on a planet and why. Mostly due to the fact that it has dominated our news about Earth's atmosphere and its rising temperatures. I now have a better grasp and understanding to it all. Still scary but knowledge is power especially in this case." "I loved getting to learn about the different atmospheres of the planets. I thought that it was so cool to learn how Venus and Mars are so similar to Earth but still so different." "Knowing which parts of a planet are older or younger is interesting. I think its interesting because we have never been to these planets, yet we can learn a lot about them and others just based on our observations." "I found the explanation of why Pluto is no longer considered a planet interesting. I guess it is interesting because as a kid, I learned it was a planet. Its just crazy that it no longer is." "PLUTO IS NOT A PLANET???? I knew this but I'm still mad about it. But on a serious note, I found the sizes of the planets very interesting and shocking." "The relationships between planet mass, outgassing, and atmosphere density. I get how they are correlated to each other, but I would like to know why this happens." "The layers of clouds in the gas giant atmospheres--I'd like to go over more on how they form different thicknesses and color." "I am finding myself struggling to wrap my mind around issues regarding the atmosphere cycle charts for Earth, Venus, and Mars. In the presentation about the runaway planets, it mentions at the end that we will be doing an in-class activity requiring us to be able to fill in two pages on the histories and greenhouse cycles for Venus and Mars. Even after going through the presentation and the reading assignment I am finding myself a little confused on how to do this properly. I know that this old brain can do it, but I might need a little more instruction on how to do so." "I'm not sure how the whole atmosphere plus distance from the sun works. It is confusing to me because I thought that Venus was too close to the sun to possibly be a livable planet, but now I'm reading that the planet's amount of greenhouse gasses also affects the amount of heat it takes in. this is at least what I have comprehended, but I am not sure if I comprehended correctly." "How Venus could be so different from Earth even though it is similar in size and not that much closer to the sun." "I thought it was slightly confusing on how one of the steps of categorizing solar system objects is whether it has a round shape compared to a lumpy potato shape. I peronally don't get why that has to be a factor aside form it having enough gravity and force to push itself together." "I find myself getting a little mixed up on how to classify stuff. Like the shape thing. How round is round enough?" "The only thing I am confused about is the fact that we haven't done more extensive research as to how our planets were formed in the ways they were, and why they are configured in the way they are. It seems that finding the answer to these questions would help us better understand not only our own solar system, but the infinite amount of others as well." "I just really like Pluto, and I really wish it could have stayed a planet. I find it confusing that the people who determine whether or not a planet is a planet do not love Pluto enough to keep it a planet. #vivalapluto"
"Because Pluto is awesome. Viva la Pluto!" "I don't think Pluto should be a legitimate planet because it doesn't completely dominate its solar orbit, but instead shares its path with several other objects of similar size and roundness." "According to the IAU classifications it is a dwarf planet, which I understand though secretly I still enjoy thinking of it as a planet in it's own right." "I am 100% neutral about the idea of Pluto be a planet. I am for it because growing up we included Pluto in our learning curriculum when it came to the solar system and it’s weird to teach the future generation that it isn't. Scientifically speaking Pluto is smaller than any other planet and even the moon yet even though it has an orbit shares it with other Kuiper belt objects. And since I had been visited by only one spacecraft in 2015 so far I just believe there's not enough information or knowledge on it." "It does not really revolve around the solar system with a regular pattern like the other planets." "I feel bad for Pluto." "I can see why there would be an argument for Pluto being a planet, however I more strongly agree that it shares an unusual orbit with other similar objects making it a dwarf planet." "I understand the reason it was deemed to not be a planet, but since I am not the most educated in this topic just yet, I feel very neutral in this argument." "Pluto was once considered to be a planet, so I do not think that it's privilege should be revoked." "According to the textbook, one of the IAU's criteria for official 'planet status' requires objects to be of a large enough mass to dominate its orbital regions, clearing said region gravitationally of most other objects. Pluto has failed to become gravitationally dominant, and thus fails to meet the IAU's standards for planet status." "I'm not sure why it isn't a planet." "To be a planet it needs to gravitationally clear away other objects from its orbit but Pluto stayed within the Kuiper belt with other icy bodies. So it is a dwarf planet." "I'm not sure on which stand I side with on this topic. Since Pluto classifies as neither a jovian or terrestrial, I don't believe it's a planet." "When I was in elementary school, I was taught that Pluto was a planet. It's weird to know now that it's considered a dwarf planet now." "I understand and agree with the reasons why it is not consider it is a planet, but I also think it just should have stayed a planet." "I do agree that we should create certain labels on how and what makes a planet, if we never did that then we couldn't be able to draw boundaries and lines when talking about our solar system." "They classified Pluto as a planet, we grew up knowing it... You can’t just take that away." "I thought I read that the reason it is not a planet is because it does not have a moon." "It follows an orbit with tons and tons of other planet-type objects, if pluto were considered a planet than so would those random objects too." "There are objects in our solar system bigger than it that aren't planets." "It is now considered a dwarf planet because of its size, and because of the discovery of different worlds in the Kuiper belt." "Pluto does not fit the current definition for a planet. However changing the definition also complicates things. It is hard to say." "Just because it has been considered a planet for this long, does not mean that it should still be since science has proven it to not be a planet. That being said, when I think of Pluto I still think of it as a planet so I do not know exactly where I stand." "I do not believe that Pluto should be a planet because according to IAU's criteria it must be able to dominate and gravitationally clear its orbital region, and Pluto does not. If we let Pluto be considered a planet even though it doesn't fulfill this criteria, what other things similar to Pluto would we have to consider to be planets?" "I think that planets should be grandfathered in although it does make sense why Pluto is not a planet." "Even though I would want Pluto to be a planet according to what classify a planet Pluto no longer makes the cut." "I do not agree that it falls inside the criteria needed to be a planet, but because we can still learn a lot from its existence we should honor its original title of planet." "It doesn't fit within the definition of a planet, but fits within the definition of a dwarf planet." "Pluto does not dominate its orbit, so it should not be a planet." "Because it only satisfies two of the three criteria to be considered a Planet. Pluto does not dominate its own orbit therefore making it a dwarf planet." "I do not believe that Pluto is a planet because it does not have an independent orbit around the moon, it orbits with many other Pluto-like masses. If we want to consider Pluto a planet we must then consider all of these similar-mass objects." "It doesnt really matter whether or not Pluto is a planet to me." "I want it to be a planet because in my childhood it was a planet. As an adult I understand the reasons it is not considered a planet." "I really want Pluto to be a planet but I understand the scientific reasons why its not." "If it doesn't meet the right standards to be a planet then its technically not a planet but maybe one day they can take a second look at the planet and rethink their decision." "How about we let Pluto be a planet again?"